Beginning of the End for Fannie and Freddie? There have long been stirrings of a potential Fannie Mae and Freddie Mac merger, or the outright dissolution of the under-fire companies ever since they fell under conservatorship back in 2008. And now it looks as if the wheels are finally in motion. Yesterday, during prepared remarks at an economic conference in Washington, FHFA director Edward DeMarco revealed plans for a “new business entity,” essentially a securitization platform that could eventually serve as the framework for the secondary mortgage market. The initial operation and funding for the business will be provided by Fannie and Freddie, though the venture will be led by individuals outside the two companies, in a physically separate location. In short, the company is being formed to replace the outdated infrastructure that exists at the two companies today, which some feel led to the mortgage crisis. Fannie and Freddie provide liquidity in the mortgage market to ensure banks and lenders have money to make new loans, but in recent years they’ve grown far too large. They’re also inherently flawed, seeing that they were public-private companies (before the takeover) that attempted to meet government housing goals while also competing with private market participants, so much so that they took part in high risk lending during the housing run-up. At present, Fannie, Freddie, and the FHA/VA support more than 90% of new mortgages originated, meaning private capital is largely absent from the mortgage market. It has been since crisis first took hold, with no one willing to take on the risk without an explicit government guarantee. Unfortunately, this means the American taxpayer is essentially guaranteeing the housing market, which is no bueno. In 1980, Fannie and Freddie owned or guaranteed just seven percent of the residential mortgage market, and saw that number spike to about 47% in 2003, per the Heritage Foundation. By 2010, Fannie and Freddie owned or guaranteed roughly half of all outstanding residential mortgages in the United States, and financed nearly two-thirds of new mortgages. Going forward, the aim is to reduce the presence of Fannie and Freddie (and the FHA) and get back to a more private mortgage market with much less government involvement. Aside from the new securitization platform, DeMarco noted that the pair is expected to reduce its massive footprint in the mortgage market by selling off loans held in its retained portfolios. They will also be directed to take part in “credit risk sharing transactions” involving things like expanded mortgage insurance and credit-linked securities from the private market. Along with that, DeMarco said he expects the FHFA to continue increasing guarantee fees in 2013, after raising them twice in 2012. This will mean higher mortgage rates for consumers, as g-fees are typically just passed along to the borrower. But the aim in increasing the fees is to lure in more private capital by making Fannie and Freddie-backed loans less competitive. 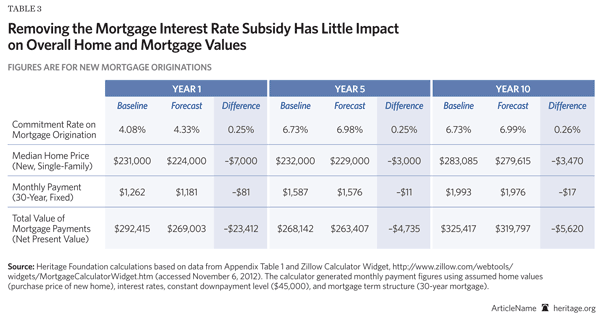 For the record, the FHA has employed similar tactics, with both the upfront mortgage insurance premium and annual mortgage insurance premium increased to account for more risk. Unlike Fannie and Freddie, it wouldn’t buy and sell mortgages, or issue mortgage-backed securities. Instead, it would leave all that to the private sector. However, it would guarantee investors the timely payment of principal and interest on the underlying securities. In the event of default, the Public Guarantor would be in a fourth-loss position, behind the borrower and their home equity, private credit enhancers, and issuers and servicers. The “PG” would also be responsible for qualifying participating institutions, establishing guarantee fees, and setting standards, including conforming loan limits. Without getting overly technical, the dissolution of Fannie and Freddie shouldn’t have an enormous impact on borrowers and the housing market at large. The Heritage Foundation (which seems to despise Fannie and Freddie) ran a simulation over 10 years and found that sales of new homes would fall an average of 0.81% and sales of existing homes would slip 1.58%. As a result, the homeownership rate in the United States would fall just 0.11% over the decade. Meanwhile, without Fannie and Freddie guaranteeing mortgages, those who wind up holding the mortgages would demand a higher interest rate to offset the increased risk. They predict rates on a 30-year mortgage to be anywhere from 25 to 40 basis points higher. In other words, instead of a 4.08% mortgage rate, you’d be looking at a rate of 4.33% or higher. However, rate movement could be a lot more volatile, with large swings and less predictable rate tracking. But because home prices would be slightly lower as well, monthly mortgage payments would actually drop. Clearly there are implications at all levels, but changes are necessary.